I had the opportunity to sit with my friend Ron Bowes (@iagox86) awhile back to talk about SEC642 content and the state of web application penetration testing in general. He mentioned hash length extension attacks, and that he had coincidentally written the absolute best tool to exploit them! That's definitely something that we would consider adding. 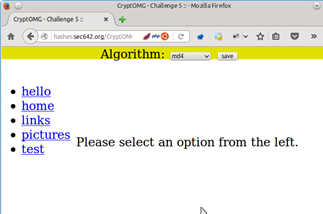 Ron has also done write-ups for capture the flag (CTF) challenges that can be solved using his tool hash_extender. We have some of the ingredients that we can talk about. We have a topic, we have a tool, and all we need is a vulnerable application. 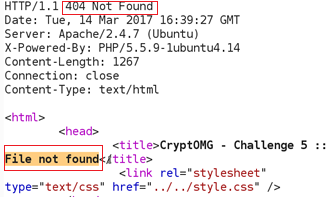 We found a vulnerable application that also included some other interesting cryptographic challenges called CryptOMG by SpiderLabs. They published the solutions to the first and second challenges on their blog. This is the solution to the fifth challenge which is a hash-length-extension attack, and of course we will use hash_extender to exploit it. Installing CryptOMG is covered in Appendix A. Our first steps are to open a browser, FireFox in this case, and configure it to proxy through Burp. In this case we are using the Samurai WTF VM, a customized version is provided in the SANS SEC642 class. 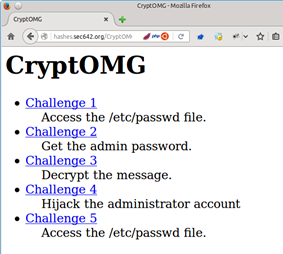 The challenge appears to be a Local File Include (LFI) to see the contents of /etc/passwd. I jumped to that conclusion based on the challenge being to access a file on the server. Selecting "SHA1" as the Algorithm, clicking on the ‘test’ link, and then Burp as a proxy shows us the parameters that we presumably have to play with to succeed. Finally, clicking on pictures we see the same two parameters with different values, the algorithm did not change. We now have a baseline request that gives us a "200 OK" response code, and presumably the contents of the "test" file in the HTML body. Regardless of the size of the file name input, the output is the same size, which tells us that they may be using a hashing algorithm. As well the output is 40 hex characters in length, or 160 bits. Let’s assume that the hashing algorithm used is SHA1. In this case the application actually tells us that it is, but it is a safe guess based on the fixed length output. The SHA1 hash of the word test is caa44616eed54257deeedb6b3508cefae7d4666d (echo -n test | sha1sum), the SHA1 sum of the word hello is d8ef3b7d2e6a8a6fdb8307dbc09759a5d1558e45 and the SHA1 sum of pictures is f7e22d3af5c9cd78567ed92d425695d33dcfe5d8. These do not match the values that we receive from the server. The application is hashing something else, or is adding something to the hash besides the file name. This leads us to believe that we may be dealing with a Message Authentication Code (MAC). This is where a known value is appended to an unknown secret value and the resultant is hashed. As it turns out this form of creating a MAC is vulnerable to a hash length extension attack. The algorithms vulnerable to the hash length extension attacks include MD4, MD5, RIPEMD-160, SHA-0, SHA-1, SHA-256, SHA-512, and WHIRLPOOL. They make use of Merkle–Damgård length padding. SHA-3 and keyed-Hash Message Authentication Code (HMAC) are not vulnerable to this attack. is also a valid MAC value, it is however different from the first one. What matters is that is passes the MAC check implemented on the server. This works best if the attacker can know the length of the secret, or through trial and error identify how long it is based on server responses. The key aspects of this attack are that the attacker is given both the original value and the signature. They are able to know or can guess the secret length and the algorithm. The application will validate the data returned back using the MAC and accept values that pass this check. The attacker appended value will then be processed by the application. This also requires that the appended value be meaningful to the application and useful to the attacker. Where they concatenate a secret with something that we can control to generate a hash. The magic of this attack is that, if we exploit that vulnerability, we can append to the filename and still generate a valid hash without knowing the original secret! However we do have to guess the length of the secret, or brute force it. In this case we are going to assume that the secret length lies between 10 and 40 bytes. Enter hash_extender! Downloading it from git and making it is quick and easy. The instructions are in Appendix B. First run ./hash_extender with no parameters to see the syntax (shown in Appendix C). The last few lines summarize the required options. Running the following should give us some file names and hashes to try! The first time I tried it I had not put enough ../ in and got a 200 response code without the file contents. The 200 response code indicates that we likely passed the MAC check. 9 iterations of ../ seemed like a good number. Running the results from hash_extender through Burp Intruder we get a hit. This was done by putting the signatures in one file, the strings in another, with both used as payloads to Pitchfork on the Burp Intruder tab. As it turns out the length of the secret was 34 bytes. Let's see what we have! This is one of the many practical attack techniques that we teach in the SANS course SEC642. remote: Counting objects: 587, done. Receiving objects: 100% (587/587), 153.34 KiB | 0 bytes/s, done. Resolving deltas: 100% (396/396), done. See LICENSE.txt for license information. The original string that we're going to extend. The format the string is being passed in as. Default: raw. The format the signature is being passed in as. Default: hex. The data to append to the string. Default: raw. the size of the signature and use the hash(es) that make sense. The length of the secret, if known. Default: 8. Output the string in a table format.